Approaching 100 animals have been rescued during ADI’s Operation Spirit of Freedom in South America and an entire cruel circus industry has been eradicated in Peru. Most of the animals have already been rehomed in specially built ADI habitats in their natural ranges – monkeys, kinkajous, a bear, a mountain lion, coatis, birds, all back in the forest where they belong. Now, we face the greatest task: To take the lions home. All 33 African lions that we have rescued on one aircraft non-stop from Peru to South Africa – the biggest airlift of its kind ever undertaken. With your help this will be the journey of their lives to take them home. Emoya is perfect for our rescued lions who have suffered so much because it is the land nature intended for them – the perfect climate, the perfect landscape and plants. A true fairytale ending for these battered but still dignified animals that once seemed to have no hope. Emoya has a no-breeding policy and is not open to the public, except by invitation. It is a wonderful, perfect home. We will be building enclosures for each family group – at least 12 separate enclosures – as well as ‘special needs’ habitats. Final building costs are expected to be around £200,000 plus ongoing costs of lifetime care. To save these animals, ADI tracked down circuses all over Peru and placed them under surveillance, then moved in with government wildlife officials. We faced angry mobs, but we could not back down. Days driving across the Andes through snow and sleet with our precious lions brought them to safety in Lima, where we built a holding facility, installing electricity, water, kitchen, security, cages and exercise enclosures. 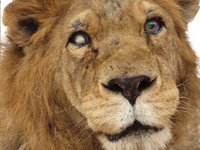 Our animal care team has nursed the lions back to health; dental and other surgeries performed as needed. The angry, frightened and aggressive animals have learnt that they will never be hurt again and the timid animals have gained confidence. Now it’s time to take them home. The lions were all born in captivity and can never return to the wild. Most have no front claws (their digits were cut off by the circus) and their teeth have been smashed. They cannot hunt. There are no sanctuaries in Latin America for these animals and the policy of the governments enforcing these laws is to encourage support for their native wildlife, so they want the exotic animals removed from the country. A cargo charter is the most economic and a direct flight the least stressful way for the lions to travel to Africa. Non-stop across the Atlantic, Lima to Johannesburg. 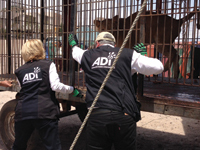 The lions will be accompanied all the way by the ADI team including a veterinarian. Our travel crates are built. Our export procedures are almost done. The cargo aircraft will cost £219,000 – so a ticket home to Africa for each lion is £6,500 – close to what some might pay for first class travel across the Atlantic or their dream holiday – for these 33 lions, it will change their lives, forever. Retirement to the land where they belong, under African skies.